Speaking at an international conference on data privacy, Apple's CEO praised the European Union and called for the US to follow its lead with federal law to protect citizens' rights agains the threat of "data-industrial complex." 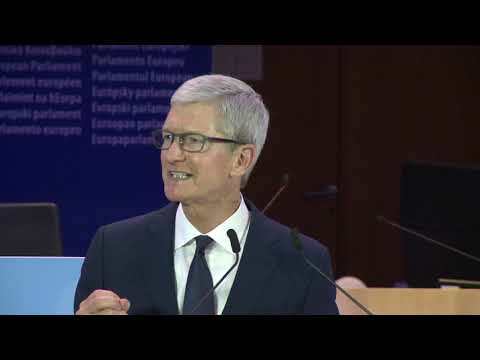 Apple CEO Tim Cook has given a strong and passionate speech at the 40th International Conference of Data Protection and Privacy Commissioners in Brussels. Speaking to loud applause, he described how data gathering algorithms are affecting us. "Our own information is being weaponized against us with military efficiency," he said, later adding, "We shouldn't sugar-coat the consequences. This is surveillance. And these stockpiles of personal data only serve to enrich the companies that collect them." In a 15-minute speech, the first by a U.S. technology CEO in the conference's four decades, he said, "We see vividly, painfully, how technology can harm rather than help. Platforms and algorithms that promise to improve our lives can actually magnify our worst human tendencies. Rogue actors and even governments have taken advantage of user trust to deepen divisions, incite violence and even undermine our shared sense of what is true and what is false. "This crisis is real. It is not imagined. Or exaggerated. Or crazy. And those of us who believe in technology's potential for good must not shrink from this moment." "Now more than ever, as leaders of governments, as decision makers in business and as citizens, we must ask ourselves a fundamental question. What kind of world do we want to live in?" Pointing out that "the desire to put profits over privacy is nothing new," Cook quoted an 1890 article by future Supreme Court Justice Louis Brandeis about the need for a right to privacy in the US. Brandeis said then that gossip had become a trade and Cook added: "Today that trade has exploded into a data-industrial complex." He said there was a crisis in data privacy and that this was harming our society. "Fortunately," he continued, "this year you [the European Union] have shown the world that good policy and political will can come together to protect the rights of everyone." Cook praised the General Data Protection Regulation which came into force earlier this year across Europe. "We should celebrate the transformative work of the European institutions tasked with the successful implementation of the GDPR," he said. "It is time for the rest of the world, including my home country, to follow your lead." He then outlined four key rights that he believes should be part of a US federal privacy law. First, there should be a right to have private data minimized. Companies should "de-identify customer data or not collect it," proposed Cook. Then we should all know what data is being collected about us and why. "This is the only way to empower users to decide what data collection is legitimate and what isn't. Anything less is a sham." Cook then said that companies should recognize that data belongs to the users and make it easy for anyone to get their own data, to correct it and if they wish to delete it. His fourth point was the right to security: "Security is foundational to trust and all other privacy rights". After listing these four points, Cook paused and told the audience that "there are many people who would prefer I hadn't said all that. Some oppose any form of privacy regulation. Others will endorse reform in public and then resist and undermine it behind closed doors." He concluded that the claim technology would be hampered by the constraints of privacy laws "isn't just wrong, it's destructive." "I'm here today because we hope to work with you as partners in answering this question. At Apple, we are optimistic about technology's awesome potential for good. But we know that it won't happen on its own. Every day we work to infuse the devices we make with the humanity that makes us." Saying that privacy is now and always be a core value of Apple's, he said: "We introduced the Macintosh with a famous TV ad channeling George Orwell's 1984 -- a warning of what can happen when technology becomes a tool of power and loses touch with humanity. And way back in 2010, Steve Jobs said in no uncertain terms: "Privacy means people know what they're signing up for, in plain language, and repeatedly." "It's worth remembering the foresight and courage it took to make that statement. When we designed this device [the iPhone] we knew it could put more personal data in your pocket than most of us keep in our homes. And there was enormous pressure on Steve and Apple to bend our values and to freely share this information. But we refused to compromise. In fact, we've only deepened our commitment in the decade since." Cook reported that he thinks a great deal about the area of Artificial Intelligence and that while it promises to benefit us: "if we get this wrong, the dangers are profound... We can achieve both great Artificial Intelligence and great privacy standards. It's not only a possibility, it's a responsibility." "As I've said before, technology is capable of doing great things but it doesn't want to do great things, it doesn't want anything. That part takes all of us. That's why I believe our missions are so closely aligned. As Giovanni [Buttarelli, European Data Protection Supervisor] puts it, we must act to ensure that technology is designed to serve humankind and not the other way around." Cook's keynote came at the start of the first public day of the 2018 conference which this year was on the theme of Debating Ethics: Dignity and respect in Data Driven Life. He spoke in the European Parliament Hemicycle. This is the first time that a head of a technology company has given the keynote speech at a ICDPPC conference and Cook is the only US tech CEO to present in person. Later today at 14:20 CET (08:20 Eastern), Facebook CEO Mark Zuckerberg will also address the conference but solely via a pre-recorded video message. Google CEO Sundar Pichai is due to do the same at 16:10 CET (10:10 Eastern). Since Cook's speech concluded, he has tweeted a summary of his key points which you can read here. I think a lot of us knew this was coming and now it’s here. I wish that the majority of US citizens felt the same way that Tim Cook does about privacy. Sadly, most do not. They'll give away their entire shopping history to Kroger to get a free turkey on Thanksgiving, or sell their soul to Facebook so they can "reconnect" with their high school classmates from a life they lived 30 years ago. It's absolutely pathetic how little you have to offer most people to get them to spill their guts and open up their private information to the data hoarders. A fidget spinner, maybe a t-shirt, free jokes from a smart (surveillance) speaker, a 10% off member-only coupon for a 30 pack of toilet paper? The GDPR privacy regulations are good but there are other EU regulations in the pipeline that are very bad in that they can destroy fair use, etc. Cook's holier than thou attitude drives me nuts. He talks about how privacy is a human right, then He kills the SE. This effectively raises the price of the cheapest iPhone by $100. All those developing markets that Apple has no market share in, can't afford the "human rights" he's are selling. What he wants is for other tech companies to adopt his model, knowing that it won't work them. It's such an underhanded move. He's trying to run the competition out of business under the guise of caring about your privacy. Agree that Apples moral high ground is not as high as it once was. They killed Cigar Aficionados App from the App Store, but allow many apps dedicated to the weed and its many methods of ingestion including smoking. The app, named "where to smoke" simply helped a traveling cigar smoker find a place to have a cigar without offending non-smokers in a city or town they are not familiar with. It doesn’t hurt that should Tim Cook’s ideas become the law of the land that would throw a huge monkey wrench into the business models of Google, Amazon, Facebook, and others. Your data is their product. This is the fundamental problem. Recentky atthe local grocery i was I was asked if I wanted to sign up for their program. Whatever they called it I turned it downflat saying that Wegmans doesn’t need to know what I eat. The look of the clerks face was amazing. It was like she was stunned that somebody would turn down the opportunity to have every single purchased tracked. There is a lot the average person can do to truncate at least some of this tracking. Never ever sign up for a customer loyalty program. Always pay with cash. Never offer up answers to questions from a telephone survey. While l agree with Cook (shocking) Apple has much it could do to improve its own use of data. And yet Google pays Apple billions to be the default search engine on iOS and the top downloaded free apps are mostly from Google and Facebook. So are you saying Cook has an ulterior motive? That was a very inspiring speech. It seems odd Google would pay so much for data that’s been stripped of any identifying information about the user. Huh, you're right. That would indicate Google doesn't need personally identifying data in order to serve up ads. Maybe they only need anonymized search results that show some IP address is searching up pink flipflops to figure out some shoe company (or computer company, or smartphone company or) might want to serve up an ad delivered to that IP by Google. Can't Apple be right about privacy and be wrong about overzealously policing apps that promote tobacco use? Not odd if Google doesn’t need identifying data for its services. "Alex Stamos, who served as Facebook’s chief security officer from 2015 through this year, took to Twitter to voice his concerns regarding Apple privacy in the country (China)"
You're right. Most U.S. citizens don't care about what happens to their personal data. Even after a couple of data breaches hardly any Facebook user deleted their accounts. U.S. consumers are only interested in using social media services for FREE. Most are totally addicted to social media, so no matter what happens, they're not going to leave it. Can you imagine all those people you see with smartphones glued to their hands going cold turkey if they're suddenly deprived of their daily social fix. They're having so much fun with their virtual friends that they can't give them up. Tim Cook is wasting his breath if the consumers themselves aren't going to fight for their own privacy. Tim Cook is only going to stand out as some crazy radical and create more enemies on Wall Street. Big investors positively love companies that siphon personal user data because they can turn that huge stack of personal data into huge stacks of gold. Every ad company in the world wants to get their hands on that data to constantly bombard internet users at every turn. I'm a senior citizen and I have no interest at all in social media and if it completely disappeared tomorrow I wouldn't blink an eye. However, I'm in a very tiny minority. All the people around me are mostly smartphone zombies who walk across busy streets with their eyes glued on their smartphone notifications. I like tech, but I'm definitely not obsessed with it.